Putin returns, but will Russia revert to ‘virtual democracy’? The Russian election cycle is over. President Putin II has once again been crowned leader. It is tempting to assume that the opposition is dispersing and the regime has survived what in retrospect will seem a merely temporary crisis; but this would be premature. Putin only won such a high percentage of the vote because he pre-selected his opponents. This was also the only reason why his 63.6% was superficially similar to the 71.9% he won in the 2004 election, which was another carefully staged contest against second-string opponents, rather than the 53.4% Putin first won in 2000, when there were still some real dragons to slay. Putin also ran a grab-bag campaign, recycling a host of old tropes and throwing out carrots to various groups of voters; but with no overarching narrative. This was enough for him to collapse (emotionally) over the finish-line; but Russia’s ‘managed democracy’ traditionally relies on dramaturgiia (artificial election drama) to animate its various virtual parts and align them together. Putin failed to manufacture one this time and the system then clearly struggled to find an internal logic without the element of strategic artifice. In short, Putin may be back, but he has not restored the status quo ante. He survives, but the system does not. The control techniques of ‘virtual politics’ that were built in the 1990s and 2000s will no longer function in the same systematic way: some techniques will survive, some will not. The decay of the system, however, is far from complete. Russia now has a self-styled ‘liberated minority’ operating in one reality, and a residual and relatively passive ‘Putin plurality’ operating in another. And never the twain shall meet. In that sense at least, the 2011-12 election cycle is an important turning point. In political science terms, Russia was a ‘managed democracy’ or ‘virtual democracy’ (pick your term) before December 2011. It is now turning into something else. In my book Virtual Politics: Faking Democracy in the Post-Soviet World, which is already ancient history having been published in 2005, I tried to predict the long-term problems that over-managing democracy with too much ‘political technology’ would create in Russia and elsewhere in the former USSR. Excessive manipulation, I argued, would generate diminishing returns, elite hubris and popular apathy. All of which are now increasingly apparent, but, unexpectedly perhaps, the rate of erosion seems to be a variable across Russian society as a whole. First, the system relied on hyped-up dramaturgiia to steamroller victory (‘organised [i.e. inevitable] victory’ was a favourite Bolshevik phrase): Yeltsin versus the Communists in 1996, Putin versus the Chechens in 1999-2000, Putin versus the oligarchs in 2003-04, and passing on the torch of Russia’s restored power in 2007-08. But manufacturing this type of political interest was always likely to get harder – unless the stakes are deliberately increased. Tactical mistakes (see below), however, meant that there was no real dramaturgiia in 2011-12. Second, it was already apparent by 2005 that the Kremlin was getting lazy, and over-relying on ‘administrative resources’ to win elections, i.e. simple fraud rather than ‘sophisticated’ manipulation. The ‘carousel’ that became notorious in the 2011-12 Russian election cycle was already regarded as a crude method in Ukraine in 2004. Driving people around in a bus for repeat voting hardly deserves the name of an election ‘technology’. Russia’s leading election analyst Aleksandr Kynev has noted the rise of another pseudo-‘technology’ that was controversial in Ukraine in 2004 (and was the key subject of negotiations before the repeat vote won by Yushchenko), namely the use of unsupervised or under-supervised mobile ballot boxes, designed for the elderly, the infirm or the allegedly infirm, who are more susceptible to pressure. And Aleksey Navalny’s famous jibe about Putin being the ‘President of Chechnia, Ingushetia and Dagestan’ reflects the lack of actual counting in the North Caucasus. On the other hand, elite hubris in Russia has grown so strong that it has also led to a certain neglect of administrative resources. In the run-up to the elections, the Kremlin removed several key governors, most notably Moscow’s longstanding major Yuriy Luzhkov, but also Mintimer Shaymyev in Tatarstan and Murtaza Rakhimov in Bashkortostan. The Kremlin was motivated purely by centre-periphery rivalries but, according to Kynev, the removal of so many local clan machines led to reduced Kremlin control over around 40 million voters; whereas the areas where it managed to tighten its grip before the elections counted for only 10-12 million voters, with no change for the other 40 million. The most obvious loss was Moscow, where before 2010 ‘Luzhkov ran a well-oiled machine directed by clear signals from the top’, but in December 2011 observers exposed ‘school teachers fixing the vote’ [Vladimir Milov interview, 7 February 2012, Moscow]. Virtual politics also fed the cycle of elite cynicism that generated it in the first place. Political technology not only masked the commodification of political power, it encouraged it. Russian elections have been emptied of mandate politics. Virtual dramas don’t have real consequences. Russian politicians have gained a radical meta-freedom; but have not used it for anything other than self-enrichment. Third, elite cynicism was bound to breed popular apathy. Electoral turnout would decline and be harder to manufacture. 60.1% was claimed for the Duma vote in 2011 and 65.2% for the presidential election in 2012. Russian turnout has been declining for years, compared to similar states where elections still matter (77.3% for the third round in Ukraine in 2004; Latvia just managed 71.1% for a referendum in February 2012), and the decline has had to be masked with ‘dead souls’. The turnout in Russia in 2011-12 was actually relatively high for transient reasons, as the dominant tactic of the new opposition was not to boycott the elections, but to vote for ‘anybody but’ ‘United Russia’ or Putin in elections that they did not participate in themselves. But this will likely prove a one-off tactic. Unless the opposition is successful with building new parties (see below), disengagement will grow. More broadly the system was also vulnerable to ‘channel switching’ - if the system depended on the message, what would happen when the electorate simply stopped listening? Particularly because the Kremlin has so over-used Putin’s charisma as a propaganda tool and exhausted much of his original impact. According to the scholar Konstantin Sonin, Putin used to be a strategic asset, but ‘his PR has over-reached in the last three years. He was on TV too much, talking about culture and sport’. He was booed at the kick-boxing event, but it wasn’t just that he was booed - why was he there? Nevertheless, Putin’s omnipresence was more of a problem for the minority who were already disillusioned with him. Liberal Moscow loves to laugh at Putin ‘discovering’ Greek amphorae from a Black Sea dive, singing ‘Blueberry Hill’ or shooting a gray whale with a crossbow. And why not? But they often seem to be laughing at the target audience as well. State TV still presents Putin’s stunts with a straight face. ‘Bombing is probably the best way to destroy a village; but to destroy a Potemkin village all that is required is to change the camera angle to reveal the improvised props holding up the flimsy façade. It has often been remarked that Putinism rested on a ‘social contract’, of order and relative prosperity in return for less democracy. Less obvious was the psychological contract that asked people to look the other way while they were being manipulated. Virtual Russia was therefore always vulnerable to psychological revolution. The current crisis was sparked not by pocket book issues, but because of a psychological liberation from pocket book politics. Again, however, this affects Russians unequally. As the money is still flowing (annual GDP growth has been around 4% since recovery in late 2009), this meant the commonly-observed paradox of the liberation of the middle classes, who want to protect what they have gained, while those still moving up the conveyor belt may wish to stay on. In June 2011 I wrote a piece for Open Democracy called ‘Political technology’: why is it alive and flourishing in the former USSR?, which was more of a short-term look at how the system might try to prolong itself - some friendly management advice, as it were. Most obviously, if political technology originally helped create the Kremlin’s elite oligopoly, it was still needed in the period of ‘high Putinism’ to help protect it. Within the oligopoly, it was periodically necessary to cut dead wood, to revive flagging or dysfunctional elements and to guard against regime defections. It was also important to police the boundaries of the system. New challenges like the global economic crisis might produce new challengers, who would need to be prevented from getting too close to the gates of the citadel. Not only would the system need lightning rods, but it would be best to place them at the city walls. For all these reasons, it was advisable to vary the formula and keep the cast list updated. So what happened in Russia over the winter of 2011-12 was a combination of the first set of long-term problems coming to the boil with the Kremlin mismanaging its own system in the short-term. This was most obvious in the run-up to the Duma elections: the Kremlin recovered its poise sufficiently to manage Putin’s re-election, but not by enough to restore systemic balance. The biggest problem was obviously the ‘castling’ [rokirovka] manoeuvre – the Russian term for the Putin-Medvedev back row job swap in September 2011. Putin failed to do what any political leader needs to do, and explain why he wanted to return to power. More importantly, he failed to phrase it as a dramaturgiia – the hyped hyper-reality version of that story that the Russian system normally provides. Without dramaturgiia, moreover, there was no distraction, and the election became a referendum on ‘United Russia’. Instead of the system creating lightning rods to channel and nullify dissent, the main regime party became the lightning rod itself. All the more so because this was the first Russian election since 1990 with no change of cast: the same four ‘Duma parties’ simply stood again, asserting their divine right to power. Even in 2007, there was ‘Just Russia’ instead of Rodina; and small parties can make the difference in changing the tone – especially because big parties like ‘United Russia’ and the Communists are never likely to say anything interesting. In this case, the big counterfactual is obviously ‘Right Cause‘– the project that wasn’t. ‘Right Cause’ was never supposed to win the election or even a significant numbers of votes, but it could have provided a very different narrative of reform renewed, or even of Putin as the strong-arm moderniser that Medvedev could never be. The ‘Popular Front’ project was also a total failure. In fact, it was worse than a total failure. It was supposed to reinvent the tired ‘United Russia’ brand, but only emphasised Putin’s distance from the ‘ruling’ party. It failed to attract a sufficient number of new faces as ‘United Russia’ monopolised its key positions. Significantly, Vladislav Surkov, the great architect of ‘managed democracy’, was sacrificed after the Duma elections. But Putin’s political system that relied on ‘managed democracy’ rather than full-blown authoritarianism needed ‘Surkov’s stability [which] depended on theatre and spectacle’. Once he was gone, ‘the mechanism for creating the drama wasn’t there’ [Simon Kordonsky interview, 5 February 2012, Moscow]. Most of Surkov’s team went too. In Yevgeniy Gontmakher’s words, ‘only technical persons are left working with Putin’ [interview, 6 February 2012, Moscow]. Surkov, on the other hand, has been saying he jumped. Perhaps he could sense the system he built no longer worked as well as it once did, and his old boss was becoming a harder sell. As was mentioned above, Putin only won such a high percentage of the vote because he had pre-selected his opponents. So Russia’s ‘managed democracy’ is still capable of some basic ‘management’ tasks. But it was clearly difficult for Putin to adjust to an atmosphere of distrust. Nevertheless, some of his fight-back after the first protests in December had traction. His flippant abuse of the opposition seemed counter-productive, but his line about ‘latte-drinking Moscow liberals’ versus the ‘real Russia’ was based on a sound ‘defensive mobilisation’ strategy. The old ‘Putin majority’ was 70-70 – both in terms of percentage of vote and turnout. The Kremlin was counting on a reduced ‘Putin plurality’ of 50-50 that nevertheless still existed and would still respond to old themes: no return to the ‘chaos’ of the 1990s, the threat of coloured revolution (see http://anti-orange.ru) and anti-Americanism, despite the risk of making Putin look even more like yesterday’s man, recycling old tropes. And, given a ‘normal’ five to ten percentage points of fraud, with Putin claiming a vote of 63.6%, this seems to have been about right. The opposition was dismissive of the Kremlin’s methods. They mocked ‘the administrative mobilisation of state workers’ [Vladimir Milov, 7 February 2012] and the use of migrants from Central Asia at pro-Putin rallies, whose spoken Russian was often poor. Indeed, ‘Tajiks for Putin’ is a dangerous strategy in the longer term, given the rise of the new Russian nationalism. The opposition also rightly saw Putin as simply trying to outnumber their own rallies with implausibly staged and strangely disengaged events, because the Kremlin was stuck in old paradigms of manipulation. In the words of Konstantin Sonin, ‘the Kremlin thinks it’s the TV message that matters... they think they can carry on with fraud and keep a lid on protests with media messages, and “anti-orange” politics’. ‘There is still too much emphasis on saying things rather than changing things’ [Moscow, 7 February 2012]. But the opposition neglected the extent to which its own liberated space was also an alternate reality and they were trapped in the paradox of criticising elections in which they weren’t actually taking part. Putin’s rallies and campaign may have seemed implausible and artificial to them, but, as Robert Ortung and Christopher Walker have argued, they created a form of reality for the majority of Russians who still get their news from state TV. And it was the clash between these two completely different realities that made it difficult for the opposition to expand its appeal. Konstantin von Eggert has even described the current situation as the ‘party of the internet’ versus ‘the party of TV’. But the bad news for the opposition is that the TV party is much bigger. According a recent Levada Centre survey, a massive 94% of Russians still mainly get their news from the TV, and only 11% from the internet, even though Russia has some 50 million regular internet users. An overall majority of 63%trust the news they hear on state TV, which exactly matches Putin’s vote. Significantly, after an initial period of opposition voices penetrating the state media after December 2011, the Kremlin has sought to re-policethe boundary. So where do we go from here? An awkward transition period is most likely. The upsurge in political activism that Russia saw between December and March may fade, but will not disappear. For a time, the vote ‘for anybody but…’ strategy was a potentially effective antidote to a system that fakes the participants before it fakes the vote. A generalised call to take arms made more sense than misplaced faith in one particular party or individual. Artemiy Troitsky says he voted for ‘Just Russia’ in December by sticking a pin in the list. But this strategy has now run its course. Potential party competition has already been unleashed by Medvedev’s ‘next-time-reforms’ announced in December 2011. Various projects are being planned from the bottom up, such as: a Navalny vehicle, Prokhorov’s new liberal party, and a new nationalist party ‘New Force’. Even the Orthodox Church has put its toes in the political waters. Elite divisions are also apparent. The Yukos affair in 2003 was used to establish a Kremlin monopoly on political manipulation, which is now eroding fast (that is, the monopoly on political manipulation is eroding, not the habit of manipulation itself), as is the taboo on presidential ambition [Gleb Pavlovsky interview, 4 February 2012]. 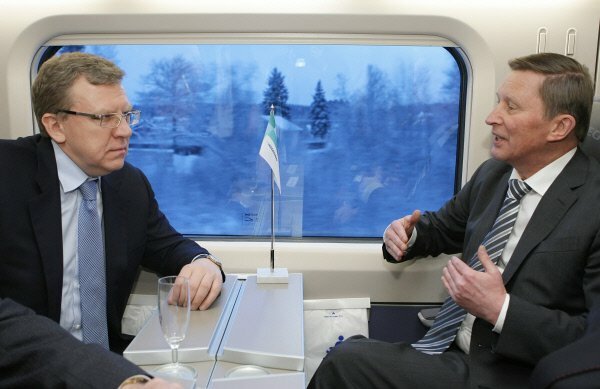 The likes of Aleksey Kudrin, Sergey Ivanov who was passed over for Medvedev in 2008, and Dmitry Rogozin a statist nationalist who could blunt the rise of people like Navalny, are all now openly jockeying for position. As is often said in Russia, ‘the real opposition is close to the leader’ [Konstantin Sonin, 7 February 2012, Moscow]. In Russia, moreover, ‘every politician is a puppet who became real: in non-democratic systems it’s hard to tell’ [ibid]. The system may have re-consolidated to an extent, but everyone is hedging their bets and the boundary between ‘insiders’ and ‘outsiders’ has become blurred - all classic signs, if not yet of the end of the regime, then certainly of the regime’s old age. But neither Putin nor Medvedev have their own party. ‘United Russia’ seems fatally damaged, with the Kremlin likely to revive plans to split it into various parts after the presidential election. Meanwhile, ‘nobody knows who the party leader is’. People were ‘waiting for a signal from above... as the centre of decision-making lies outside the party, in the Kremlin’ [Olga Khrystanovskaya interview, 6 February 2012, Moscow]. The previously fake ‘Duma parties’ may be caught in the middle. On the one hand, they now have to compete to survive. The ‘Petrushka effect’should encourage them to strike out on their own. On the other, the Kremlin will try to rein them back in – they were notably absent from the first muted post-elections protests on Monday 5 March. A repoliticising Russia would however be closer to the median Russian voter. That would most likely mean fewer foreign adventures and two to three years of internal focus. According to Vladimir Milov [in Russian], it might also mean a more left-populist Russia. It might also mean, as one of the demonstrations’ more paradoxical slogans had it, ‘Rossiia bez Puta’ (‘Russia without Put’ – a play on Putin’s name, but meaning ‘Russia without a direction’ or ‘path’). The regime could sit out the protests and crack down. According to Simon Kordonsky [interview, 5 February 2012, Moscow], ‘Without Surkov, there is no mechanism for stability. [First Deputy Head, Presidential Administration] Volodin is trying to build a new stability. We’re living in an interregnum’. But Russia has already had a partial legitimacy crisis, which a crackdown would exacerbate. Putin has to an extent already played the role of the ‘Russian Pinochet’ once before in 2000-03 – combining authoritarian politics with liberal economic reforms. He seems too long in the tooth to play it again. Plus, it was not the formula the protestors were looking for. When Putin first announced his return for another potential twelve years, critics talked of a ‘new Brezhnev era’ or a new ‘time of stagnation’; but in September 2011 people assumed this would be a sleepy scenario, with an anesthetised population and reasonable ongoing growth, but fundamental structural problems remaining unsolved. An active minority protesting against those very structural problems is a very different scenario. Putin had to let the protesters blow off steam. The most likely scenario is hybrid: a war of manoeuvre between virtual politics and real. The system has eroded but not collapsed. The culture of manipulation is deeply ingrained. The new opposition may opt for a more real politics, while the more passive ‘Putin plurality’ may still be manipulable to an extent. Or, as in the 1990s, the boundary between state politics and regime parties on the one hand, and ‘the democrats’ on the other will be blurred, particularly because the Kremlin will still play dirty. Instead of isolating and marginalizing the opposition, the Kremlin will likely try to infiltrate, integrate, imitate and co-opt it. The new party law will of course lead to a proliferation of new parties, which will make this easier. It is worth reiterating just why Russia has been so reliant on ‘political technology’ in the first place. Most obviously, it helps disguise the reality of a kleptocratic regime. More subtly, the regime has been reliant ondramaturgiia because Putin’s fundamental narrative – that he is the good Tsar reining in the bad boyars – is fundamentally false. Second, political technology has traditionally been a relatively low-cost route to maintaining elite power. Russia is a weak state, and does not have the resources for full-on authoritarianism. Political technology also traditionally carried fewer costs in Russia’s relationships with the West, where it is still important that Russia claims the credentials of various types of club membership. More subtly again, the costs of regime maintenance can still be kept down by keeping at least some of the population complicit in the psychological contract. Here, again, the Kremlin’s position is weaker. Full-blown repression is unlikely. But the cost of dealing with the new opposition is now higher. Ironically, the last elections were no more corrupt than in the past. But because the context changed, the West took more notice of fraud. It may also require a rising dose of economic resources to keep the ‘Putin plurality’ intact and quiescent, which will be economically inefficient. And above all virtual politics worked best when both the Russian population and the rest of the world weren’t paying too much attention. For a time, it even fed off the very disillusion it helped create. Now that there are more critical voices and prying eyes, the Grand Illusion is gone. Putin’s new Russia will be more like a street merchant disguising the quality of his shabby wares.